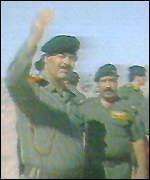 The summary of a recent Pentagon report says there was "no 'smoking gun'" connecting Saddam Hussein to al-Qaeda. One can just imagine how furiously somebody must have lobbied to have that language included, because those are the same three magical words that have been successfully used to convince the public that Saddam had no weapons of mass destruction. Because the "smoking gun" standard is entirely subjective, the existence of such a thing can never be proven, at least not to the satisfaction of a determined contrarian. Thus have the most intransigent critics of the war effort succeeded in granting themselves veto power over the facts. Regardless of the evidence of Saddam's WMD, there cannot be a "smoking gun" until Hans Blix, Cindy Sheehan and the New York Times agree to say that there is. That's the degree of denial that's necessary to characterize the Pentagon report as anything other than an absolute vindication of the war in Iraq. That study, comprised of information culled from the evidence left behind by Saddam's government, makes it clear to all but the willfully obtuse that removing the Iraqi dictator was essential to any serious effort to combat terrorism. A Senate Intelligence Committee report issued in 2006 had taken an imprisoned Saddam Hussein's word for it that he had not cooperated with al-Qaeda, although the terror group had met repeatedly with his Iraqi Intelligence Service (IIS). This new study, which has received far less media attention, tells another story. "Captured documents reveal that the regime was willing to co-opt or support organizations it knew to be part of al-Qaeda," it concludes, "as long as that organization's near-term goals supported Saddam's long-term vision." The identities of two of Saddam's beneficiaries ought to be enough to cause the Senate to rescind, and apologize for, its attempted exoneration of the deposed Iraqi government. One of those groups is Egyptian Islamic Jihad, Ayman al-Zawahiri's organization that became the nucleus of al-Qaeda. The other is the Afghani Islamic Party, which Stephen Hayes of The Weekly Standard tells us controlled that part of Afghanistan where Osama bin Laden established his training camps in the early 90s. In addition, Saddam has funded Ansar al-Islam, which has become the core of al-Qaeda in Iraq, as well as Filipino al-Qaeda affiliate Abu Sayyaf, and a Bahrainian group called the Army of Muhammad, which an IIS document describes as an "offshoot of bin Laden" whose use of a different title "can be a way of camouflaging the organization." This tells us not only that Iraq was collaborating with al-Qaeda, but that it was doing so surreptitiously. That's why we're learning that Saddam assisted many affiliates of, and precursors to, bin Laden's organization, but we're not likely to find a picture of the Butcher of Baghdad directly handing Osama an enormous check, as if he'd just won the Dinah Shore Classic. Not that it would make any difference, as long as we are operating under the "smoking gun" standard. Even if we had a video of the two men's lips meeting as they nibbled their way from opposite ends of a long strand of spaghetti, the Democrats and therefore the news media would forcefully deny any relation between them. They'd probably even argue that if the two villains were really in cahoots, they'd never be careless enough to be seen together. Perhaps because of our gullibility regarding dual-use materials related to Saddam's WMD programs, he seems to have understood that all he needed was a modicum of deniability in order to placate the West. If an al-Qaeda terror cell wanted to be eligible for Iraqi funding, all it needed to do was change its name to al-Cougar Mellencamp, and it could count on the rest of the world to play dumb. By swiftly dismissing the evidence as it arises, the three magic words have spared the "Bush lied" chorus responsibility for everything about which it has been proven wrong. Critics of inaccurate prewar intelligence have themselves been far less accurate in their anti-war intelligence, such as their certainty that Islamic terrorists would never cooperate with an infidel like Saddam. As long as they maintain that there's "no smoking gun" to the contrary, however, they need never admit fault. By refusing to accept unwanted realities, they've relegated themselves to the land of the anti-war lotus-eaters, where they remain comfortably numb to the impact of the emerging facts. The tragedy is that most American news consumers have become unwittingly trapped in that haze-filled netherworld with them.